From the offset, we have challenged the actions and proposals of those in authority with regard to what was proposed for the old hospital site. Initially, we contacted the Government with a request that the front of St Luke’s, the administration block, the main corridor and the ballroom, all be retained under the Listed Building Status. It had been hoped that the administration block could have been used as offices within the new building project and the ballroom as a social centre/feature for the new residents and as a meeting place so they would not have to venture down to Goosnargh Village Hall for example for such functions. The Government rejected this application on the grounds that the buildings did not have any particular architectural features which would qualify them for this status. We also tried very hard to ensure that the mosaic at the front of Cameron House was uplifted and placed either in the banking at the entrance by North Lodge, or, in the entrance to the cemetery. This would, we have been assured, have been a considerable task as the mosaic construction was as “teeth” and these went down some way into the ground. 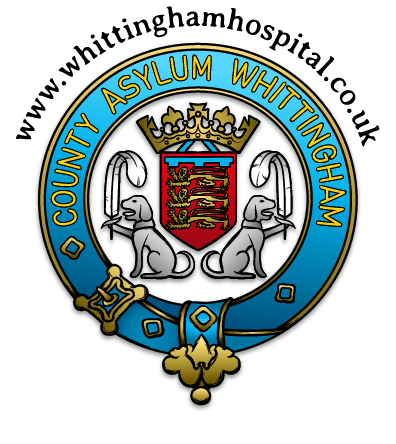 Despite the arguments, we felt that this should have been preserved as it depicted a complete and unblemished coat of arms of the hospital. Alas, once and we were to be disappointed and nothing came of our entreaties. Meetings were arranged between the Probation Services in Preston and the people who then controlled the site, English Partnerships, to make an effort to improve the cemetery. It was verbally agreed that English Partnerships would be able to find a quantity of stone chippings and the Probation Service would provide working parties to level off the edges of the pathways and lay the gravel. All this was to be done without charge as funds we did not have and there were no foreseeable ways of making funds available. Alas, this also met with a nil result as, although verbally agreed, nothing came of the decision and the people involved are no longer contactable. Help was offered by one individual who worked for a local council (outside Lancashire) dealing with applications for funding from sources which held funds for projects. Unfortunately, this also developed into a dead end and nothing has been heard for the past twelve months. We have maintained our “watching brief” on the cemetery and initially caused some consternation by reporting to the War Graves Commission that the graves therein were not in an acceptable state. This was quickly rectified! We have continued to ensure that Poppies are placed on the War Graves and the area in which the German Soldiers are buried, each year. Notification of this action has also, each year, been made to the German equivalent of the British War Graves Commission. What the future holds for the cemetery is still uncertain. Regulations state that the cemetery itself cannot be touched for 99 years after the last burial, that being Jimmy Sherriff. With the political situation as it is, the War Graves Commission could, should they so decide, have the War Graves removed to another site. This is not the case for the German Soldiers. The opportunity to have these bodies disinterred and removed to the German War Cemetery at Cannock Chase was dismissed jointly by the UK authorities at the hospital and the German Commission due to that fact that the hospital authorities could not guarantee that the actual remains potentially removed would be those of the German Soldiers. This was due to the method of burial at the time in which the deceased were not in coffins but shrouded and placed in the ground as they were. After the passage of so much time, one level would have collapsed onto the level below and become mixed together thus removing the positive identification. On the authority of the German Commission, the bodies were to remain where they were and all markings of the grave site were to be removed. We continue to remember them in addition to our own War Dead. We shall continue to report on events at the hospital site and in particular the cemetery. St John’s church, although a Grade II listed Building, is in a state of almost dereliction. The floors have gone through and the building is open in parts to the elements and nature. We shall se to wait and see what develops and what the future holds.